Radishes are a root crop that can be juicy, pungent, or sweet in taste. They also come in a variety of colors, including white, red, purple or black, and in terms of shape, they can be long, and cylindrical or round. Radishes may be eaten raw, cooked or pickled. The oil obtained from the seeds of radish is used in a number of beneficial health applications. Radish is an edible root vegetable with a pungent taste. The parts of the radish plant that are commonly consumed are the leaves, flowers, pods, and seeds. The scientific name of radish is Raphanus sativus which belongs to the Brassicaceae family. Radishes are also known as daikon in some parts of the world, primarily in Asian markets. According to the USDA National Nutrient Database, radish is rich in various nutrients which include potassium, calcium, sodium, and vitamin C. It contains vitamins including B-vitamins (thiamin, niacin, riboflavin, folate, and vitamin B6), vitamin A and vitamin K. It also provides minerals such as iron magnesium, phosphorus, and zinc. Radishes are very good for the liver and stomach and act as a powerful detoxifier too. For many hundreds of years, it was considered by most that radishes would help purify the blood by eliminating toxins and waste. In the 17th century, it was thought that radishes are extremely useful in treating jaundice because they remove bilirubin and keep their production at a stable level. Radishes reduce the destruction of red blood cells that occurs in people suffering from jaundice by increasing the supply of fresh oxygen to the blood. Black radishes are more preferred in the treatment of jaundice, and radish leaves are also very useful for the same. It is still considered by many to be an effective home remedy for this disorder. There are countless reasons why radishes are a good addition to your diet, but improving your immune system is one of the most important benefits. Eating half cup of radishes daily in a salad or just as a snack provides nearly 15 percent of your daily intake of vitamin C. Consistently maxing out your daily dose of vitamin C intake can rejuvenate your immune system by replacing many of the antioxidants and white blood cells which are integral in fighting off every illnesses from the common cold to cancer! Vitamin C (also known as ascorbic acid) not only boosts your immune system but is also considered a super vitamin because of all the high-impact effects it has on the body. It helps regulate your metabolism and is vital to the body’s process of changing fat into usable energy. It is also the main contributor to the creation of collagen, an essential protein that strengthens blood vessel walls and reduces the chances of atherosclerosis and heart diseases. Radishes are rich in fiber which can add considerable bulk (and regularity) to bowel movements that may help relieve the symptoms of constipation. A 2008 study suggests that radish leaves can also help firm up loose bowels and get rid of loose stool or diarrhea. Furthermore, radishes are known to promote the production of bile. Bile is one of the most important parts of good digestion, and also helps to assists both the liver and gallbladder. Radishes are considered to have roughage and are composed of indigestible carbohydrates (specifically lignin, a type of insoluble fiber). This facilitates digestion, water retention, and alleviates constipation, which is one of the major causes of piles also referred to as hemorrhoids. As a good detoxifier, they help relieve the symptoms of piles very quickly. Radish juice also soothes the digestive and excretory system, further relieving the symptoms of piles. Since radishes are detoxifiers and are rich in vitamin C, folic acid, and anthocyanins, they have been linked with having a protective effect against some type of cancers, particularly colon, kidney, intestinal, stomach, and oral cancer. Research on the anti-cancer potential of radishes suggests that as they are part of the Brassica family, these cruciferous vegetables are packed with antioxidants that have chemopreventive properties. Furthermore, the isothiocyanates (chemicals produced by plants) found in radishes have a major impact on the genetic pathways of cancerous cells. They alter the pathways so much, that they can cause apoptosis (cell death) thereby eliminating cancerous cells from reproducing. Radishes are diuretic in nature, which means that they increase the production of urine. Radish juice also helps reduce inflammation and may relieve the burning sensation during urination. It may also inhibit infections in the kidneys and urinary system, thus helping the treatment of various urinary conditions that are exacerbated by excess toxins in the system. A 2012 study revealed that radish has antifungal properties. It can help induce cell death in a common fungus known as Candida albicans, which can cause oral infections and vaginal yeast infections. Radishes are very filling, which mean that they satisfy your hunger without running up the calorie count. They are also low in digestible carbohydrates, high in roughage (insoluble fiber), and contain a large water content. Thus they are a very good dietary option for those who are determined to lose weight. Furthermore, they are high in fiber and low on the glycemic index (GI), which means that they regulate bowel movements, thereby helping in weight loss and increasing the efficiency of metabolism. Radishes are a great source of anthocyanins, a flavonoid, which not only give color to radishes but also provide numerous health benefits. Anthocyanins have been the subject of numerous medical studies, and have been positively associated with reducing the occurrence of cardiovascular diseases. The detoxifying and anti-carcinogenic properties of radishes make their seeds useful in the treatment of leucoderma. You can eat radishes as well to aid in the treatment of leucoderma. Note: Radish seeds can be powdered and soaked in vinegar, ginger juice, and then applied on the white patches. However, consult a medical professional before trying this. Radishes are an anti-congestive, meaning that they decrease congestion of the respiratory system including irritation of the nose, throat, windpipe, and lungs that can come from colds, infections, allergies, and other causes. They are a great disinfectant and are rich in vitamins, which further protects the respiratory system. Radishes have a strong, natural spice to them, and they are also quite pungent, which is very good for preventing illnesses. They also eliminate excess mucus in the throat. Furthermore, radishes have been known to soothe sore throats and relieve congestion by clearing the sinuses. Radishes are a very good source of potassium, which contributes to a large list of health benefits. Research by Dr. Haddy, Mayo Clinic, suggests that potassium helps in reducing blood pressure. It is also a main component of the very popular and effective DASH diet. When potassium interacts with the arterial supply of vascular beds, it can relax the blood vessels, and therefore promote blood flow. It also reduces the blood pressure by widening the flow of the blood, instead of forcing it through narrow, constricted channels. Radishes have long been known to have a low glycemic index, which means that eating a radish does not significantly impact blood sugar levels. Also, an in vivo study published in 2017 states that drinking radish root juice has a positive effect on the blood glucose levels of diabetics. They may also help regulate the absorption of sugar into the bloodstream, meaning that diabetics don’t have to worry as much about sudden spikes or drops when eating or being away from food for a certain amount of time. Given the nature of this study, more research is needed to confirm the efficacy of these results. Vitamin C, zinc, and some members of the vitamin-B family, present in radishes are good for the skin. The high water content in radishes also helps to maintain healthy moisture levels and hydration of the skin. Smashed raw radish is a good cleanser and serves as an efficient face mask. Due to its disinfectant properties, radishes also help clear up skin disorders like dry skin, rashes, and cracks. Due to the presence of niacin, it also helps prevent the skin condition pellagra. It is considered by some that radishes help lower body temperature and relieve inflammation from fevers. 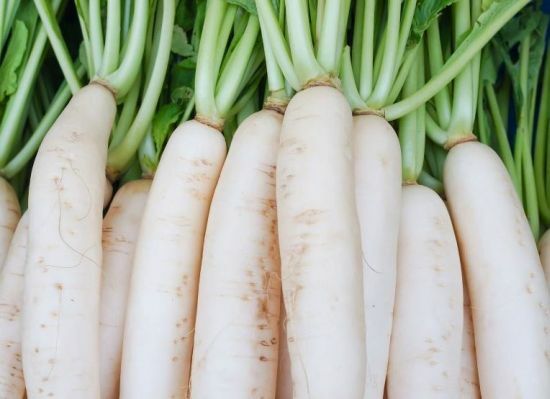 A good method of intake is drinking radish juice mixed with black salt, and since they act as good disinfectants, radishes also fight infections that can cause fever. Radishes are thought to act as a diuretic, cleanser, and disinfectant which can aid in relieving symptoms of kidney ailments. They are low in potassium and phosphorus and may make a great choice for patients on hemodialysis. Radishes have antipruritic properties and can be used as an effective treatment for insect bites and bee stings. Radish juice may also reduce pain and swelling and soothes the affected area. Radishes are mostly composed of water so they are a great way to keep your body hydrated, which is very beneficial for your health. Adequate hydration is beneficial for digestive and overall health. Staying hydrated may assist in relieving constipation, improving digestion, and ensuring proper uptake of nutrients from the food we eat. Radishes are considered beneficial for liver and gallbladder functions and a few studies have been conducted to determine the effects. One such study published in 2012 suggests that white radish enzyme extracts may help protect against hepatotoxicity. However, as this was a study conducted using animal subjects, further research is required to confirm the true dose, impact, and efficacy of radishes on liver health. Black radish juice has been used as a folk remedy by people from Mexico to eliminate gallstones. An animal study published in the Journal of Biomedicine and Biotechnology found that black radish juice may provide relief from cholesterol gallstones and may also reduce triglycerides and increase HDL or good cholesterol levels. Apart from the benefits outlined above, radishes work well as an appetizer, breath freshener, laxative, and metabolism regulator. Intake of radishes may help protect against various health conditions as mentioned above. Whether it is to improve digestive health, enhance your skin, or just incorporate more vegetables into your diet, you can’t go wrong with nutrient-packed power food radishes! Average rating 4.1 out of 5.0 based on 1352 user(s).